Lemon Yogurt Pasta - Free Spirit & Mind! 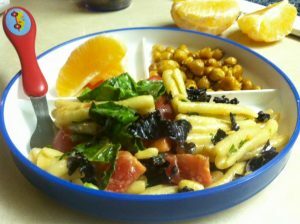 As a single mom sometimes I find it hard to create delicious, healthy & quick meals for my sweet little boy (who is four at the moment) and I. All of the demands, responsibilities & time restraints make it hard to spend much time in the kitchen to prepare healthy meals that are not from a box or containing loads of preservatives. Pasta seems to be one of those meals that I can prepare, toss just about anything into it & my little one will usually enjoy it. 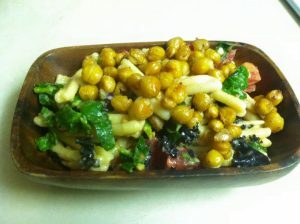 Organic whole wheat pasta, kale, spinach, tomatoes, pine nuts tossed in olive oil, plain yogurt, lemon juice, fresh basil, salt & pepper & topped with toasted chickpeas & a side of fresh tangelos from a friends yard! Delicious, creamy & totally healthy! Bring water to a boil, toss in raw pasta for about 20 minutes or until Al dente. 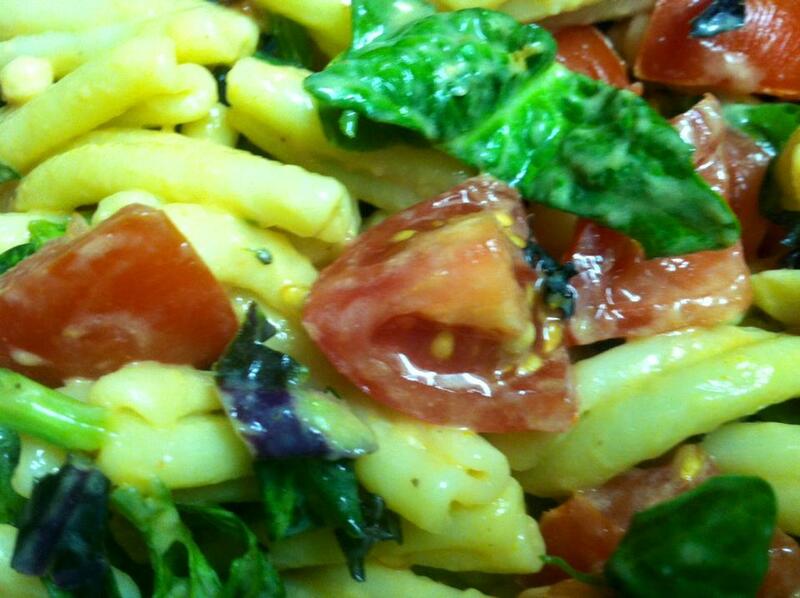 In the mean time dice up tomatoes, kale, spinach & basil. Once pasta is tender, drain & toss in olive oil, turmeric, nutritional yeast, kale & spinach (the heat allows them to cook slightly & become tender as well) then mix well. Once mixed toss in pine nuts, yogurt, salt & pepper and Enjoy! I made my own chickpeas by cooking in a crockpot for part of the day. You can use a can if you do not make your own chickpeas. 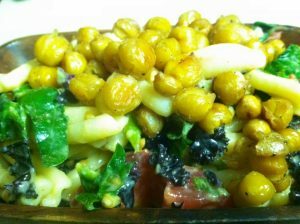 Simply preheat over to 425 degrees, while heating oven place chickpeas, olive oil, salt & pepper into a plastic bag, mix gently & once over is heated place mixture into a baking dish & bake for 20 minutes. If you time it right both the pasta & chickpeas should be ready at the same time. Hope you Enjoy, please let me know what you think, feel free to leave a comment down below. This entry was posted in Home, Natural Living, Vegetarian Lifestyle and tagged 20 minute meals, free spirit and mind, freespiritandmind, kid friendly meals, Lemon Yogurt Pasta, quick meals, quick recipes, simple recipes, toddler favorites, toddler meals, vegetarian meals, vegetarian noodles, vegetarian pasta, veggie pasta. Bookmark the permalink.